Zone-Reflex: TGD and D.Rakovic. The quantum field body, a comprision. The problem of superpositions and quantum field body. A comparision between two models. Both TGD and the Rakovic model are based on p-V pair corresponding to the geometric, classic existence and is replaced with generalized force-generalized coordinate pairs in quantum fluctuating degrees of freedom, the same as in Popps model. Quark - N pair corresponds to 'objective existence' defined by quantum histories and N is generalized to a number of particle like excitations in the photon number state resulting in the state preparation. Rakovic talks of biomolecules where Pitkänen talks of particles and dark matter. The difference between the models is in the consciousness mechanism, mainly. In TGD cognition and intention are linked to p-adic primes; Rakovic see no need to talk of dark matter and primes, only complex valued quantum field holography. How that holography arise remain unclear to me. "I suggest you to read my attached paper on integrative medicine to see my viewpoint on the origin of quantum-coherent states in acupuncture system/consciousness", said Dejan Rakovic in a mail, regarding the superconduction in biology. Quantum-informational medicine and quantum-holographic informatics, with special reference to numerous psychosomatic-cognitive implications, is the approach 'in developed countries', he says. "Psychosomatic diseases indicates the necessity of application of holistic methods, implying their macroscopic quantum origin. The most intelligent way is the treatment of man as a whole and not diseases as symptoms of disorders of this wholeness. The focus of these quantum-holistic methods are the body’s acupuncture system and consciousness, incl. quantum-informational medicine with quantum-holographic informatics - with surprisingly significant psychosomatic and cognitive implications." Rakovic call his model the biophysical quantum-holographic/quantum-relativistic model of consciousness. TGD involves a quite far-reaching generalization of the space-time concept and, apart from the notion of quantum jump, reduces quantum theory to in finite-dimensional geometry, which is highly unique from the mere requirement that it exists. Quantum TGD requires the introduction of several new mathematical tools and concepts. Dark matter hierarchy with p-adic primes in a scaled up topological way. TGD is also a classic physical theory based on 'the wholy trinity' from the elemental particle physics. The emergence of the notions of zero energy ontology and hierarchy of Planck constants together with the increased understanding of the special features of number theoretical universality have led to a considerable deepening of the understanding during last half decade. Can this new physics give the answer? What are the similarities between TGD and Rakovic model? Non-locality (infiniteness) in both space and time is given in quantum TGD. It is the interaction between non-locality and locality that make up the interactions in the (quantal) magnetic body. This means also that the time concept will change, which is behind the consciousness. Rakovic says: "The quantum-informational structure with memory attractors as a possible quantum-holographic informational basis of psychosomatic diseases." Then what is these structures with attractors? To get an answer on that we need to look at quantum non-material memory (from quantum computer science). The first Bose-Einstein condensates were generated in 1995. A Bose–Einstein condensate represents the most 'classical' form of a matter wave, just as an optical laser emits the most classical form of an electromagnetic wave. Optical lattices are interference patterns comprised of laser beams, which are shone onto the atomic cloud and force their periodic structure onto it, with the creation of crystal-like formations, as results. Atoms and molecules move completely freely and randomly in gases unlike they do in solids. All vectors are free? The interesting aspect is that the movement of the atoms in an optical lattice within a quantum gas is similar to the behavior of electrons in solid bodies. Quantum gases are thus able to simulate the physical properties of solid bodies. So, in quantum world are no choises (no 'environment' because of the non-locality?). The free will, the intention, where does these things emerge? This is true for matter, but certainly also for living matter. Quantum computing relies on the transmission of entangled qubits, or 'quantum bits', over distance in the form of photons. As photons travel along the lines they degrade steadily. Therefore, a device that can read and retransmit the signal would allow for the transmission of quantum data over any distance. This is what happens in the meridians in Popps model. The photons functions as solitons. The same function as in the nerve pulse of TGD and the Heimburg group. An optical lattice uses laser beams of different frequencies, shining in the same area, to create energy 'buckets' that hold atoms in place. The lattice can be tuned to place atoms where they are desired, and it can be used to extend the lifetime of quantum memory. The Georgia Tech team. The red spheres are atoms sitting in the energy 'buckets' created by interfering laser beams. Wikipedia. To encode information onto the atoms, a laser beam carrying a signal is shined on the array of atoms confined to the lattice. Each atom stores a portion of the quantum information, which is sensitive to the relative locations of the atoms. The lattice, therefore, allows the information to be stored longer by preserving the locations of the atoms more effectively. This memory is physical (atomic)? The quantum memory is degrees of freedom on an atom. These energy 'buckets' are the same looking as the cells cytoskeleton tensions inducing 'buckets' on the environment in the extracellular matrix (Ingber 1998). So memory can be physical, stored in tensions in the tissues? Physical + quantal memory. Cleland group do research on quantum integrated circuits, based on the Josephson phase qubit, a superconducting device whose operation relies on the physics of the Josephson junction (low electrical impedance and relatively large capacitance). Other groups have used spin etc. The qubit is coupled = entangled groups of degrees of freedoms. This was an extension, but I think it was necessary to understand the quantum memory, at least for me. Rakovic: "Peruš’s theoretical investigations show that any quantum system has formal mathematical structure of quantum-holographic Hopfield-like neural network . Then memory attractors of the acupuncture network can be treated as psychosomatic disorders representing EM MW/ULF-modulated (quantum)holistic records = gives a biophysical basis of (quantum)holistic local psychosomatics? (removed only holistically + extreme efficiency of the quantum-informational therapies, that consequently erase the very information of the psychosomatic disorders). And according to the Tibetan traditional medicine, an acupuncture procedure must be repeated every several months – presumably as a consequence of restituted patient’s mental loads from his mental-transpersonal-environment of closely related relatives/enemies/deceased, that remained non-reprogrammed on the level of quantum-holographic collective consciousness." So, if one changed, then also the other, but in an iniert way, as life itself is iniert. The memory is iniert. The mental aspect is most important. It is (quantum)holistic. Is memory an EM-system or even quantal? And a memory can be a collective/individual stress trapped in the tissue network. Pitkänen: "The identification of quantum jump between quantum histories as moment of consciousness defines microscopic theory of consciousness whereas the notions of self and self hierarchy allow to understand macroscopic aspects of consciousness absolutely essential for brain consciousness. Self is identified as a sub-system effectively behaving like its own subuniverse quantum mechanically, and physically self is a sub-system able to not generate bound state entanglement with environment during subsequent quantum jumps. Also self measurements are possible leading to a completely unentangled state." History requres memory and memory requires a self. And we have two self, one quantal and one physical. The quantal self has the memories? Also two consciousnesses. Rakovic: "For modeling most cognitive and especially psychosomatic functions the subtle biophysical acupuncture neural networks (modulated by UNF EM fields of brainwaves) are necessary as well, combined with quantum decoherence theory. It appeared, within the Feynman propagator version of the Schrödinger equation, that the quantum level is described by analogous mathematical formalism as Hopfield-like quantum-holographic associative neural network. How the quantum parallel processing level gives rise to classical parallel processing level, which is a general problem of the relationship between quantum and classical levels within the quantum decoherence theory. They demonstrate existence of two cognitive modes of consciousness (direct religious/creative one, characteristic of quantum-coherent transitional and altered states of consciousness, and indirect perceptively/rationally mediated one characteristic of classically-reduced normal states of consciousness) – together with conditions for their mutual transformations." Might this correspond to the different brain halfs? Pitkänen: The reduction of the standard quantum measurement theory to fundamental quantum physics is a triumph of TGD approach. Each quantum jump involves localization in the so called zero modes having interpretation as classical variables characterizing the observable geometric properties of the space-time surface, and thus of external macroscopic observer (magnetic body), together with an additional condition guaranteing that the density matrix characterizing the entanglement between quantum fluctuating degrees of freedom and zero modes is diagonal, implies standard quantum measurement theory. Rakovic: "Quantum neural holography combined with quantum decoherence might be very significant element of the feedback bioinformatics, from the level of cell to the level of organism. Whole psychosomatics is quantum hologram, both on the level of individual and collective consciousness, and that quantum-holographic hierarchical parts carry information on wholeness, enabling quantum-holographic fractal coupling of various hierarchical levels. Acupuncture-based-quantum-informational (un)intentional control of ontogenesis and morphogenesis; quantum-holographic language-influence on the genes expression, with implications of great psychosomatic significance of thought-emotional contents; and global fractal information coupling of various hierarchical levels in Nature with fundamental holistic implications on the origin of miraculous deep creativities and determinism of the History through the coupling with the existing evolving state of collective consciousness. This forecasts a great synthesis of two cognitive/consciousness modes. The personal role becomes indispensable due to the influence and care for collective mental environment, which is fundamental question of both mental health and civil decency, i.e. of both spiritual and civil morality. Some manifestations of consciousness must have deeper quantum origin – with significant psychosomatic and transpersonal implications." Pitkänen: The dynamics of self measurement is governed by Negentropy Maximization Principle (NMP), which speci es which subsystems are subject to quantum measurement in a given quantum jump. NMP can be regarded as a basic law for the dynamics of quantum jumps and states that the information content of the conscious experience is maximized. In p-adic context NMP dictates the dynamics of cognition. It is the quantal self that is repaired (by max. information, magnetic body, observer), and it direct our physical self which is hierarchial. The last stage is 'arousal' or awareness, attention etc. The energy grows with computation/entanglement. This is usually called the 'self' in biology. The archetypes in Jung, that is information from the past, but today is also told of an influence from the future (Holger Nielsen among others). There are a big confuseness on the terminology. I usually prefer Damasios terminology. Pitkänen: "TGD predicts two kinds of super-conformal symmetries, super-Kac Moody symmetries assignable to partonic 2-surfaces identi able as time = constant sections of light-like causal determinants (diamonds) of 4-surfaces correspond to the gauge symmetries of fundamental interactions. Super-symplectic symmetries act at imbedding space level, with some future/past light-cone of space. There is a fractal hierarchy of quantum holograms inside quantum holograms. Super-symplectic representations correspond to genuine quantum gravitational e effcts since wave functionals in the space of threesurfaces are involved: space-time ceases to be a passive arena of quantum dynamics. Super-symplectic degrees of freedom makes massless extremals ideal candidates for the correlates of higher level consciousness." Rakovic considers information processing within the central nervous system as occurring through hierarchically organized and interconnected neural networks. - Peruš’s neuro-quantum multilayer neural networks. Rakovic: "It is firstly noted that models of brain’s hierarchical neural networks demonstrate encouraging advances in modeling cognitive functions – which is not surprising bearing in mind that information processing on the level of central nervous system is going via hierarchically organized and interconnected neural networks. It seems that this hierarchy of biological neural networks is going down to sub-cellular cytoskeleton mesoscopic level, being a kind of interface between neural and quantum levels." This sounds like the reductionistic emergent kind of consciousness, as a consequence of network complexity. But also Pitkänens self-entanglement is of the same kind. No essential difference. Pitkänen: "Self measurements are governed by Negentropy Maximization Principle, and give rise to quantum level self repair mechanism. In p-adic context NMP is the basic variational principle of cognition. The quantum jump at a given level of hierarchy corresponds to a sequence of quantum jumps at lower levels, which also contributes to the experience of the higher level self. The last stage gets the highest energy level (because these sub-selves entangle and give energy) and is the 'wake-up' self." "The proposal is that the dynamics of consciousness is governed by Negentropy Maximization Principle, which states the information content of conscious experience is maximal." "Negentropy Maximization Principle (NMP) codes for the dynamics of standard state function reduction and states that the state function reduction process following U-process gives rise to a maximal reduction of entanglement entropy at each step. In the generic case this implies at each step a decomposition of the system to unique unentangled subsystems and the process repeats itself for these subsystems. The process stops when the resulting subsystem cannot be decomposed to a pair of free systems since energy conservation makes the reduction of entanglement kinematically impossible in the case of bound states. The natural assumption is that self loses consciousness when it entangles via bound state entanglement." Arousal-stage where dopamine is important? In the model of Hopfield’s classical neural network, emergent collective computation is either regulated by global (variational) minimization of the Hamiltonian energy function or by local (interactional) network learning in discrete or continuous forms (incorporating spatio-temporal description of neuronal and synaptic activities). Haken has shown that introduction of biologically more plausible neuronal oscillatory activities gives richer dynamics of the neural network, with Hopfield’s classical neural net real-valued variables replaced by the complex-valued ones (similarly to quantum variables, although in contrast to thus conveniently modified classical formalism, the complex-valued quantum formalism is essential). A step further was done with quantum generalization of Hopfield’s classical neural network: Sutherland’s holographic neural network and, equivalent to it, Peruš’s model of Hopfield-like quantum associative neural network. Again, not so big difference. P-adics versus complex-valued quantum formalism are used. Kohonen maps:"Kohonen - a system model that is composed of at least two interacting subsystems of different nature. One of these subsystems is a competitive neural network that implements the winner-take-all function (digital), but there is also another subsystem that is controlled by the neural network and which modifies (modifying neurotransmitters) the local synaptic plasticity of the neurons in learning (LTP). The learning is restricted spatially to the local neighborhood of the most active neurons. The plasticity-control subsystem could be based on nonspecific neural interactions, but more probably it is a chemical control effect. Only by means of the separation of the neural signal transfer and the plasticity control has it become possible to implement an effective and robust self-organizing system. The SOM principle can also be expressed mathematically in a pure abstract form, without reference to any underlying neural or other components. The first application area of the SOM was speech recognition." The SOM is one of the most realistic models of the biological brain function, acc. to his latest book. Dynamic modeling using nonlinear state-space models, on his web page, with simulations. Also relational models, with many real-world sequences such as protein secondary structures or shell logs exhibit rich internal structures, logical hidden Markov models, etc. We combine two of these methods, relational Markov networks and hierarchical nonlinear factor analysis (HNFA), resulting in using nonlinear models in a structure determined by the relations in the data. This model is a structure and a field oscillating on the structure. Gao et al 2008: "Inference of latent chemical species in biochemical interaction networks is a key problem in estimation of the structure and parameters of the genetic, metabolic and protein interaction networks that underpin all biological processes. We present a framework for Bayesian marginalization of these latent chemical species through Gaussian process priors. A challenging problem for parameter estimation in ODE models occurs where one or more chemical species influencing the dynamics are controlled outside of the sub-system being modelled. For example, a signalling pathway can be triggered by a signal external to the pathway itself. In a regulatory sub-system, one or more transcription factors (TFs) may influence the expression of a set of target genes, but these TFs may not be regulated at the transcriptional level, instead being activated by another sub-system such as a signalling pathway. Similarly, in a metabolic pathway external metabolites and enzymes will influence the dynamics of the pathway. If these external chemical species have a constant influence, e.g. as in the case of steady state behaviour of a metabolic pathway, then they can simply be treated as additional parameters of the model and their effect can be estimated along with the other model parameters. However, more often these external factors are time-varying quantities." Hopfield-like neural network have certain shortcomings as descibed by Joya et al, 2002. They are widely used in neural computings. The complex neural fields can change both the amplitude and the phase, and their dynamics has a close analogy with the dynamics of self-oscillation generated in a phase-conjugate resonator. Torres et al.2003 in 'Influence of topology on the performance of a neural network': "the capacity to store and retrieve binary patterns is higher for attractor neural network with scale–free topology than for highly random–diluted Hopfield networks with the same number of synapses." Pitkänen: In standard physics context the existence of the required macroscopic quantum phases is not at all obvious whereas the new physics implied by TGD predicts their existence. The point is that the Universe according to TGD is a quantum critical system. Quantum criticality is mathematically very similar to thermodynamical criticality and implies long range quantum correlations in all length scales. This in turn implies the existence of macroscopic quantum phases. TGD Universe is also quantum spin glass with state degeneracy broken only by the classical gravitational energy of the space-time sheets having same induced Kähler fi eld. This degeneracy makes it possible to have quantum coherence over time periods longer than CP2 time of order 10^-39 seconds characterizing the duration of single quantum jump so that biosystems can act as quantum computers in macroscopic time scales. Mitja Perus, 2000. NEURAL NETWORKS AS A BASIS FOR QUANTUM ASSOCIATIVE NETWORKS. "We have got a lot of experience with computer simulations of Hopfield’s and holographic neural net models. Starting with these models, an analogous quantum information processing system, called quantum associative network, is presented in this article. It was obtained by translating an associative neural net model into the mathematical formalism of quantum theory in order to enable microphysical implementation of associative memory and pattern recognition. In a case of successful quantum implementation of the model, expected benefits would be significant increase in speed, in miniaturization, in efficiency of performance, and in memory capacity, mainly because of additionally exploiting quantum-phase encoding. We have earlier presented in detail how and where the mathematical formalism of associative neural network models by Hopfield and Haken is analogous to the mathematical formalism of quantum theory. By saying Hopfield-like we mean a system that is based on the Hopfield model of neural networks or spin glass systems (i.e., amorphous assemblies of spins or small 'magnets'), respectively. The results depend very much on the correlation structure of a specific set of input patterns. In other words, beside the 'hardware' (implementation) and the 'software' ('algorithm'), also the 'virtual software' (i.e., the input-data correlation structure) is essential." Small magnets are used also in the creation of the magnetic boby (magnetic flux tubes). Baez says it in another way in What's the energy density of the vacuum? : You need to know not just the answer, but also the assumptions and reasonings that went into the answer. Silent knowledge is important. This is the quantal self. Pitkänen: "For algebraic entanglement p-adic Shannon entropies obtained by replacing logarithms of probabilities with the logarithms of their p-adic norms are well-defined, and there is a prime p for which Shannon entropy is negative and minimum and identifiable as negentropy. The vision about dark matter hierarchy leads to a more refi ned view about self hierarchy and hierarchy of moments of consciousness." Perus: "If we try to implement Shannon-type information processing in quantum networks, some essential quantum features, manifested in the complex-valued formalism, are unavoidably partly eliminated. However, nature has obviously always performed a sort of non-Shannon-type implicit-information processing (Bohm uses term 'active information') where the 'users of information' are not human observers, but natural systems (e.g., immune systems) themselves. Neuro-quantum (classical-quantum) cooperation, as manifested in the collapse-readout, is thus essential for the brain which combines Shannon-type cognitive information and non-Shannon-type consciousness phenomenalism." The quantal self is also the dark matter self, as a mirror-self of 'antimatter'? It is achieved by "The hierarchy of dark matter levels and is labelled by the values of Planck constant having quantized but arbitrarily large values." This is the spooky action of quantum mechanics in a nutshell. Pitkänen: "Dark matter hierarchy leads to a quantitative model for high Tc superconductivity as quantum critical phenomenon predicting the basic length scales L(149) and L(151) associated with lipid layers of cell membrane and cell membrane itself. Also cell size emerges naturally. At higher levels of dark matter hierarchy scaled up versions of this basic structure appear. Cyclotron states at magnetic flux tubes are carriers of Bose-Einstein condensates of Cooper pairs and of bosonic ions. For instance, neurons correspond to k(em) = 3 level of dark matter hierarchy whereas ordinary EEG correspond to k(em) = 4, with Josephson junctions as the (superconductive) mediating tool." Rakovic: "An additional support that the acupuncture system is really related to consciousness is provided by meridian (psycho)therapies (with very fast removing of traumas, phobias, allergies, posttraumatic stress, and other psychosomatic disorders – with simultaneous effects of visualization and tapping/touching of acupuncture points." This I have personal experiencies of. Sometimes you can just wonder what a miracle is happening also to very severe, lifelong traumas, seen in many of my patients. - "A ’smearing’ and associative integration of memory attractors of the psychosomatic disorders, through successive imposing new boundary conditions in the acupuncture energy-state space during visualizations of the psychosomatic problems." Pitkänen: "The connection between thermodynamics and qualia was the real breakthrough in the development of ideas. In some sense this finding is not a news: the close connection between pressure sense and temperature sense and thermodynamics is basic facts of psychophysics (also neural nets, my comm.). In TGD framework the contents of consciousness is determined as some kind of average over a sequence of very large number of quantum jump. Thus non-geometric qualia should allow a statistical description generalizing ordinary thermodynamical ensemble to the ensemble formed by the prepared states in the sequence of quantum jumps occurred after the last 'wake-up' of self. For instance, this picture allows to see the ageing of self with respect to subjective time as an approach to thermal equilibrium." The world of conscious experience is classical, means standard quantum measurement theory follows." Pitkänen: "There are two basic mechanisms generating sensory qualia. 1. Quantum phase transition in which single particle transition occurs coherently for some macroscopic quantum phase produces qualia de fined by the increments of quantum numbers in the transition. The magnetic quantum phase transitions at super-conducting magnetic flux tubes provide a basic example of this mechanism, and the quantum model of hearing relies on Z0 magnetic quantum phase transitions. 2. The flow of particles with fixed quantum numbers between "electrodes" of what might be called a quantum capacitor induces qualia defined by the quantum numbers of the particles involved. 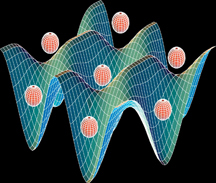 The "electrodes" carry opposite net quantum numbers. Second electrode corresponds to the sub-self defining the quale mental image. Obviously cell interior and exterior are excellent candidates for the electrodes of the quantum capacitor. Also neuron and postsynaptic neuron. In fact, living matter is full of electrets defining capacitor like structures. The capacitor model applies to various chemical qualia and also to color vision and predicts that also cells should have senses. The ensuing general model of how cell membrane acts as a sensory receptor has unexpected implications for the entire TGD inspired view about biology." Pitkänen: "The observation that Shannon entropy allows an infinite number of number theoretic variants for which the entropy can be negative in the case that probabilities are algebraic numbers leads to the idea that living matter in a well-defined sense corresponds to the intersection of real and p-adic worlds. This would mean that the mathematical expressions for the space-time surfaces (or at least 3-surfaces or partonic 2-surfaces and their 4-D tangent planes) make sense in both real and p-adic sense for some primes p. Same would apply to the expressions defining quantum states. In particular, entanglement probabilities would be rationals or algebraic numbers so that entanglement can be negentropic and the formation of bound states in the intersection of real and p-adic worlds generates information and is thus favored by NMP. For n=2 it contains all rational multiples of integer valued points defining Pythagorean triangles, for n=3,4,... only origin is as rational point . The mappings of the real geometric structures to their p-adic counterparts interpreted as cognitive mappings plays also key role in TGD inspired theory of consciousness." At center of the interception lies factors like protein transcription and folding mechanism, DNA memory and coding, phase transitions, phosphorylation etc. these are mechanisms that in fact are coding for life itself. That border between classical and quantum physics are nets like the nervenets and acupuncture meridian nets? They are doing the 'dance' in a sensitive, collecting way? What is special is that the nerves can be seen as skin, invoked in the body, as 'skin channels'. Skin and nerves belongs to the same embryological tissue. Skin is extremely sensitive. Cognition and consciousness are hierarchic. Pitkänen: Cognition are of two types. "Quantum TGD requires the introduction of several new mathematical tools and concepts, in particular p-adic numbers. p-Adic number fields Rp (one number field for each prime p = 2; 3; 5; :::) are analogous to real numbers but differ from them in that p-adic numbers are not well-ordered. p-Adic physics describes the physics of cognitive representations and matter-mind decomposition at space-time level corresponds to the decomposition of space-time surface to real and p-adic regions. The higher the value of p, the better the resolution of cognitive experience is, so that p serves as kind of intelligence quotient. p-Adic length scale hypothesis provides quantitative realization for the hierarchy of space-time sheets and is in key role in TGD inspired theory of consciousness. The spin flipping transitions associated with the fermionic generators of super-symplectic algebra might give rise to Boolean consciousness with intrinsic meaning ('This is true'). Quantum numbers at opposite light-like elementary particle horizons of a wormhole contact could correspond to Boolean cognition in which the presence/absence of fermion representing to 1/0. Boolean statements might be just bit sequences without consciously experienced intrinsic meaning (1/0 instead of true/false)." Of some reason I think of left, versus right brain half. And 'enlightment'. Rakovic: "It should be especially pointed out that quantum decoherence might play fundamental role in biological quantum-holographic neural networks, through adaptation of the energystate hypersurface of acupuncture system/consciousness (in contrast to low-temperature artificial qubit quantum processors where it must be avoided until the very read-out act of quantum computation! = the 'virus model' presented earlier) – which implies that Nature presumably has chosen elegant room-temperature solution for biological quantum-holographic information processing, permanently fluctuating between quantum-coherent states and classically-reduced states of acupuncture system/consciousness, through non-stationary interactions with out-of-body farther environment and through decoherence by bodily closer environment." Pitkänen: "Everything is conscious and consciousness can be only lost" with the additional statement "This happens when non-algebraic bound state entanglement is generated and the system does not remain in the intersection of real and p-adic worlds anymore". This is the reason the Schrödinger cat hasn't been recognized? It is 'out-of body experiencies'; not dead or alive, although death is one form of this quantum state. It is dead and alive. Life itself is a paranormal phenomen. Life is a critical phenomenon. The body is no border for our 'self'. There is a 'magnetic body' too. What is the purpose of this magnetic body, this oscillating wave-function? Is it the collection of qualias; the use of our classical, decoherenced body as a sensor and motor organ for our magnetic body, as Pitkänen suggests? He writes in General Theory of Qualia: "The idea is that EEG (or ZEG, WEG, or GEG) massless extremals can be assigned with entanglement of a subself of magnetic body with sub-self of biological representing various mental images. That sub-selves can entangle with selves remaining themselves unentangled is one aspect of the generalized notion of sub-system and inspired by the hierarchy of space-time sheets allowing to identify the space-time correlate for this kind of entanglement as join along boundaries bonds connecting space-time sheets representing the sub-systems of disjoint space-time sheets. The entanglement in question could be in cyclotron degrees of freedom, charge entanglement, or color entanglement. Although EEG and its generalizations seem to serve communication and control purposes rather than representing qualia directly, the notion of spectroscopy of consciousness makes still sense. Furthermore, the identification of the fractal hierarchy of EWEGs and GEGs means a dramatic generalization of this notion making precise quantitative predictions in a huge range of frequency scales resulting by simple scaling from EEG. Cyclotron frequency and Josephson frequency, can be assigned with the communications of sensory data to magnetic body and the n frequencies from both types with the quantum control performed by the magnetic body. For ordinary EEG the harmonics of cyclotron frequencies of bosonic ions correspond to alpha band and its harmonics assignable to quantum control. Beta and theta bands and their analogs for the harmonics of alpha band correspond to the communication of sensory and cognitive data to the magnetic body. The rough correlations of EEG with the state of consciousness can be understood." Rakovic: "Lower hierarchical quantum-holographic macroscopic open quantum cellular enzyme-gene level, which might be also functioning on the level of permanent quantum-conformational quantum-holographic like biomolecular recognition – so that quantum neural holography combined with quantum decoherence might be very significant element of the feedback bioinformatics, from the level of cell to the level of organism. This presumably represents a natural framework for explanation of psychosomatic diseases related to somatization of environmentally-generated memory attractor’s states of the open macroscopic quantum acupuncture system/consciousness – quantum-holographically projected upon lower hierarchical cellular level, thus changing the expression of genes (so called macroscopic 'downward causation', as biofeedback control of microscopic 'upward causation' in ontogenesis and morphogenesis, starting from the first fertilised cell division which initialises differentiation of the acupuncture system of (electrical synaptic) 'gap-junctions'." This means that the lower levels get the conscious inputs from the surroundings and modify them. Eventually the genes can also be incorporated in this change (epigenetics), if necessary. The conscious part is reflected also to the genes, analogy to the sensory input into the nerves are reflected to the brain? And in fact the conscious part is diminished/computated and transformed/made negentropic in the process. The consciousness is computated in the networks in an upwards regulation, and the motoric output is a result of that computation, seen in the readiness potential by Libet. Perus: "It seems that, in the brain, neural networks trigger the collapse of quantum wave-function and thus transform the quantum complex-valued, probabilistic dynamics into the neural(classical) real-valued, deterministic dynamics. So, neural nets serve as an interface between classical environment of the organism and its quantum basis." Rakovic: "It seems that this hierarchy of biological neural networks is going down sub-cellular cytoskeleton mesoscopic level, being a kind of interface between neural and quantum levels. Quantum-holographic hierarchical parts carry information on wholeness, enabling quantum-holographic fractal coupling of various hierarchical levels." Pitkänen: "Self hierarchy has as a geometric correlate, the hierarchy of space-time sheets. The scaling of hbar (ground state) by wavelength^k means also scaling for various basic quantum scales like Compton length and - time and de Broglie wave length. Compton length correspond to a size of space-time sheet associated with the particle. The energy of dark photons with frequency f is scaled up by wavelength^k. For instance, EEG photons at k(em) = 4 level of dark matter hierarchy have energy which is above thermal energy at room temperature: this is absolutely essential for understanding the role of EEG photons. The phase transition increasing k(em) by one unit means that the sizes of space-time sheets are scaled up by wavelength. If the density of particles is high enough, the overlap criterion for the formation of a macroscopic quantum phase is satisfied in the resulting dark phase and Bose-Einstein condensates become possible. Decoherence phase transition for dark matter particle means that the size of the space-time sheet is scaled down by 1/wavelength." Rakovic: The whole psychosomatics is quantum hologram, both on the level of individual and collective consciousness, and that quantum-holographic hierarchical parts carry information on wholeness, enabling quantum-holographic fractal coupling of various hierarchical levels. Phenomenologically approved quantum-holographic (fractal) coupling of various hierarchical quantum levels – from-biological cell-to-acupuncture system/consciousness-to-collective consciousness (quantum-holographic feedback on cells’ conformational protein changes and genes’ expression (so called macroscopic ’downward causation’), and not only reversed (microscopic ’upward causation’), with mutual quantum-informational control of ontogenesis/embryogenesis and morphogenesis, starting from the first division of the fertilized cell when differentiation of the acupuncture system begins – with significant psychosomatic and cognitive bioinformational implications). With implications of great psychosomatic significance of thought-emotional contents; and global fractal information coupling of various hierarchical levels in Nature with fundamental holistic implications on the origin of miraculous deep creativities and determinism of the History through the coupling with the existing evolving state of collective consciousness. There is significant correlation between spectra of the numerical presentation of constitutive elements of primary sequences (amino acids, nucleotides) and their biological activity or interaction in corresponding biomolecules (proteins, DNAs). The presence of peak with significant signal-to-noise ratio in a multiple cross-spectral function of a group of sequences with the same biological function means that all of the analysed sequences within the group have this single-electron RRM frequency component in common, with the following general conclusions: (1) such a peak exists only for the group of biomolecules with the same function; (2) no significant peak exists for biologically unrelated biomolecules; (3) peak frequencies are different for different biological function; (4) ligand-proteins and their biomolecular target-receptors have the same characteristic frequency in common but almost opposite phase – providing also novel theoretical possibilities for protein de novo design with desired functions! In the context of the RRM-model, the same characteristic single-electron RRM frequency, and almost opposite phase, presumably characterises not only biomolecular protein and target general function, but also their macroscopic quantum biomolecular recognition interaction on the level of biological cell – possibly by externally activated (compositionally/chemically, by averaged intermolecular approaching of proteins and targets necessary for non-vanishing overlap integrals of the corresponding electronic and vibrational wave functions, or thermally/optically, by supplying vibrational energy necessary for making conditions for electronic-vibrational nonradiative resonant transitions between two isomers, giving rise to dynamic modification of the many-electron hypersurface of the cell's protein macroscopic quantum system. Pitkänen talks much of resonances, cyclotronic and other. 3. modern symptomatic Western medicine, whose activities through immunology, pharmacology, biomedical diagnostics, and surgery, hinder or soothe somatic consequences of the carelessness on the first two levels. Pitkänen: The concept of many-sheeted space-time leads to fresh proposals for how biosystems manage to be macroscopic quantum systems. Examples of these mechanisms are so called wormhole superconductivity, electronic high Tc super-conductivity, neutrino super-conductivity, ionic and a mechanism for generating coherent light and gravitons. So it seems that science is closing the circle, by re-discovering two cognitive modes of consciousness and at the same time by imposing its own epistemological limitations – as it was preserved for millennia in shamanistic tribal traditions, or as it was concisely described by Patanjali in Yoga Sutras, pointing out that mystical experience (samadhi) is ’filled with truth’ and that ’it goes beyond inference and scriptures’. Pitkänen: This encourages to think the possibility of replacing the idea of a fixed axiomatic system with a living and dynamically evolving system becoming conscious of new axioms from which new theorems can grow. Mathematician would not be anymore an outsider but and active participator affecting the mathematical system he is studying. For instance, when paradoxal statement represented symbolically becomes conscious in quantum jump sequence, also the context in which it was originally stated changes. The ancient time cease, the new magic time comes. This is of course only a small part of the extensive litterature from both authors. The similarities are striking, although there of course also are big differences. I wanted to use citations not to distort the meanings too much, although this is like reading the Bible through small verses. To compare these models may though lead forward quite a lot. Next I will compare with Popps model. As a rule TGD goes much deeper into the explanations and its strength is the coordination with theorethical physics, although the same features can be seen in Rakovic works at a higher hierarchial level. Haken H.: Synergetic Computers and Cognition (A Top-Down Approach to Neural Nets). Springer, Berlin, 1991. Donald E. Ingber, 1998: The Architecture of Life. A universal set of building rules seems to guidethe design of organic structures — from simple carbon compounds to complex cells and tissues. Scientific American January 1998, 48 - 57. The holographic view (I have met Mitja Perus for a couple of times in Liege) emerges also in TGD framework. The basic problem is what holography really means. Mathematics allows huge number of options but physics would suggest that counterpart of laser light is involved. The problem of standard physics is that hbar is too small to allow coherence in brain scale. These energies are in the range of visible and UV photon energies (one would expect .04-.08 eV energies characterizing IR light but the realization that cell membranes as critical systems are most naturally almost vacuum extremals led to a modification of the model; as a consequence the energy range is scaled up). Why I take this modification seriously is that it predicts large breaking of parity symmetry which indeed characterizes living matter and is a complete mystery in standard model. One particular, quantitative success is correct prediction for the frequencies of peak sensitivity for photoreceptors. Josephson frequencies are proportional to 1/hbar and vary in huge range from about 10^14 Hz to the time scale of decades. The most amazing outcome is that EEG photons result in the decays of these Josephson radiation to bunches of ELF photons and biophotons result when they transform to singe ordinary photon. Two seemingly totally unrelated notions are unified which is always a good sign. Josephson radiation is what makes biosystem a hologram in purely physical sense. Magnetic body included since Josephson radiation communicates sensory data to the magnetic body by inducing cyclotron transitions. Motor action proceeds in reverse time direction by negative energy Josephson radiation. Continuation to the previous email. Josephson radiation can in principle regenerate basic qualia along sensory pathway. Sensory receptors have specialized to experience and nothing else: they use most of their lipids for this purpose in cells along the sensory pathway. Neurons become kind of sensory homunculi with every lipid of at least axon serving as a pixel with colors defined by the qualia associated with it. This means fractality and a very concrete realization of holography. This could have been guessed: already genomes make cells informational fractals/holograms so that only a generalization of this observation is in question. One can assign to each cell a value of Planck constant characterizing its evolutionary level. The corresponding Josephson frequency is inversely proportional to 1/hbar and is the lower the higher the level is since the time scale of planned action and memory becomes longer with increasing hbar. For instance, the neurons in the associative regions of brain are rather intelligent and civilized and pixels carry quantum associations of various qualia like colors, tastes, etc... In cerebellum the neurons are not so educated. The time scale of synchrony is 160-200 Hz whereas in hippocampus it is around 5-12 Hz and 40 Hz at primary sensory areas. There would be also cells producing kHz Josephson radiation and with frequency which corresponds to time scales of years. Also the glia, in particular astrocytes are in fundamental role. In fact, they might correspond to highest representations of data between magnetic body and sensory receptors. At this level the oscillations of membrane potential reflecting themselves as frequency modulations of frequencies of generalized EEG would represent the sensory data. Brain would be like a flock of singing whales or orchestra playing instruments whose octaves would be characterized by Planck constant and speech and singing would be one particular example of a completely general representation of information as frequency modulation of Josephson frequencies. Note that also ordinary speech relies on frequency modulation as becomes clear by playing a recorded speech very slowly so that speech and singing are not so different basically. One new piece of theory is a detailed proposal for how the Mersenne primes and Gaussian Mersennes (as many as four of them in the crucial length scale range 10 nm-2580 nm with big at both sides!) are involved. The proposal is that there is hierarchy of copies of weak interactions and color interactions at these length scales plus their dark scaled up variants. The idea is that when dark scaled up variant of Mersenne scale is second Mersenne scale a resonance of the two physics occurs. Dark gauge bosons transform to their non-variants with much smaller mass. This would occurs only near quantum criticality (near vacuum extremal property for cell memrane). However, this is very simple consequence of the Perus’ discovery that any quantum system has formal mathematical structure of Fopfield-like quantum-holographic neural network. Its propagator (quantum-holographic memory of the quantum system) enables at the input of the Hopfield quantum-holographic neural network a successive reconstruction of the wave functions of the memory states (complete, i.e. amplitudes and phases!) in recognizing wave functions of the states shown at their input (which is the basis of any holography! ), whereas everything is simplified as compared to standard laser holography (which requires coherent reference and object laser beams)! [see Ch. 2 of my monograph "Integrative Biophysics, Quantum Medicine, and Quantum-Holographic Informatics: Psychosomatic-Cognitive Implications", for details]. I have added the comments that belongs to the text. I thought the qubit is the answer. A qubit can be of different size depending on the function. It can be coupled (decoherence) or decoupled (quantum state). The dance happens between these both stages. The size of the qubit is not that important. The stressors come from the minimal side, means quantal side. They are then emotions etc. electromagnetic disturbances. Thank you for the comments you have added to the text.